Background: International evidence suggests that dementia is under–diagnosed in the community and that General Practitioners (GPs) are often reluctant to engage to their fullest capability with patients who exhibit cognitive symptoms. This is potentially reflected by a lack of GP knowledge about the syndrome. However, it is also recognised that attitudes and confidence are important in relation to how and to what extent a GP approaches a person with dementia. This research sought to develop a reliable and valid measure of GPs attitudes and confidence towards dementia. 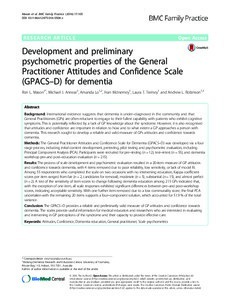 Methods: The General Practitioner Attitudes and Confidence Scale for Dementia (GPACS–D) was developed via a four stage process, including initial content development, pretesting, pilot testing and psychometric evaluation, including Principal Component Analysis (PCA). Participants were recruited for pre–testing (n = 12), test–retest (n = 55), and dementia workshop pre–and post–education evaluation (n = 215). Results: The process of scale development and psychometric evaluation resulted in a 20-item measure of GP attitudes and confidence towards dementia, with 4 items removed due to poor reliability, low sensitivity, or lack of model fit. Among 55 respondents who completed the scale on two occasions with no intervening education, Kappa coefficient scores per item ranged from fair (n = 2, candidates for removal), moderate (n = 5), substantial (n = 15), and almost perfect (n = 2). A test of the sensitivity of item scores to change following dementia education among 215 GPs indicated that, with the exception of one item, all scale responses exhibited significant differences between pre–and post–workshop scores, indicating acceptable sensitivity. With one further item removed due to a low communality score, the final PCA undertaken with the remaining 20 items supports a four–component solution, which accounted for 51.9 % of the total variance. Conclusion: The GPACS–D provides a reliable and preliminarily valid measure of GP attitudes and confidence towards dementia. The scales provide useful information for medical educators and researchers who are interested in evaluating and intervening in GP perceptions of the syndrome and their capacity to provide effective care.